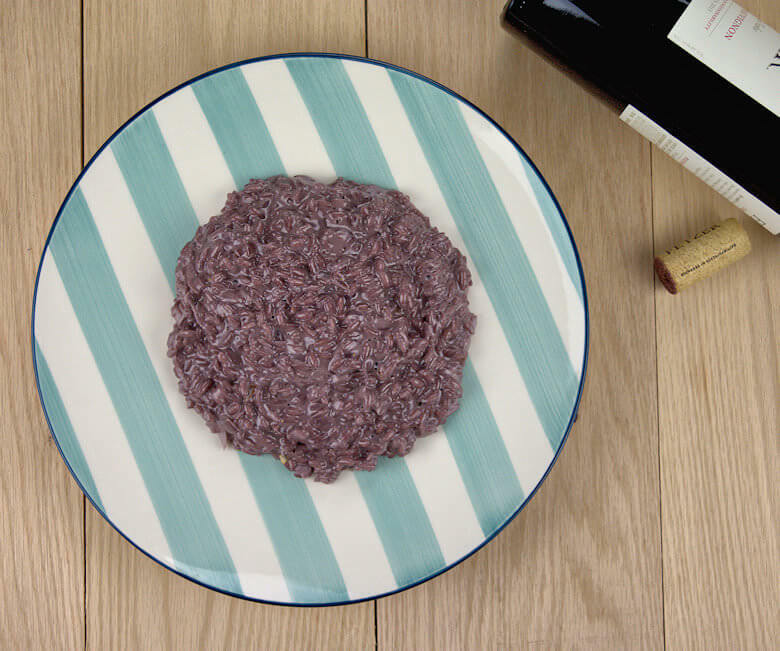 Simple red wine risotto with mascarpone. Wine with dinner and in your dinner. Most of the alcohol, if not all, will evaporate during the cooking of the risotto, but not the flavor. Without breaking the bank, use a red wine that will give you a good flavor; may be the same wine you will be drinking with this dish. I used a Cabernet Sauvignon. This is not considered a bold wine, but it does give the risotto a nice winy flavor and I am not going to wine about it. Imagine what you can do with a bolder wine, a Zinfandel for instance. A little longer than a year ago I made a spaghetti dish with Zinfandel: Red Wine Spaghetti with Pepper Confetti. I used Zinfandel, because the pasta spends less time with the wine during cooking, so you need to start a little stronger. 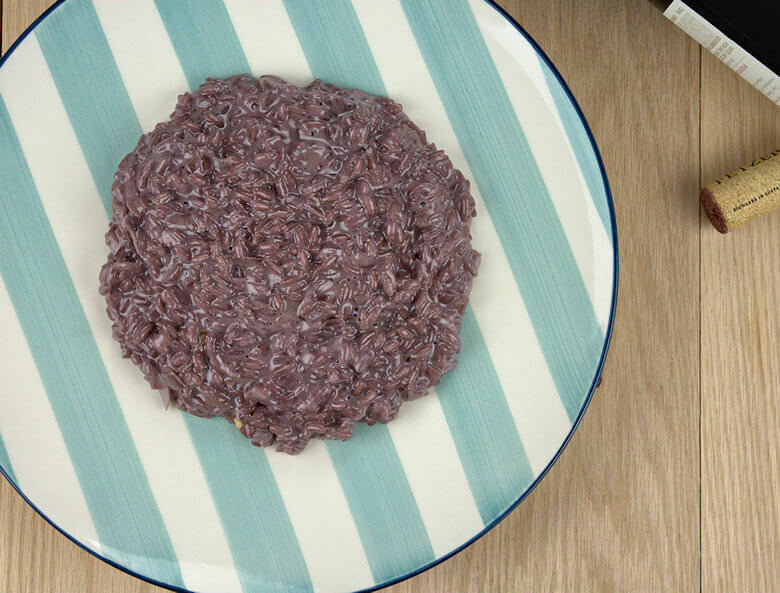 In the case of this Red Wine Risotto with Mascarpone, you’re cooking the rice for about 20-30 minutes with the wine, so more intensity and you can get away with a less strong wine. With a little bit of imagination, this dish almost looks like a plate of brains. I know that is a weird thing to say, but that what came to mind when I looked at it. And it is not something I see every day, actually never seen brains on a plate. OK, back to the normal. 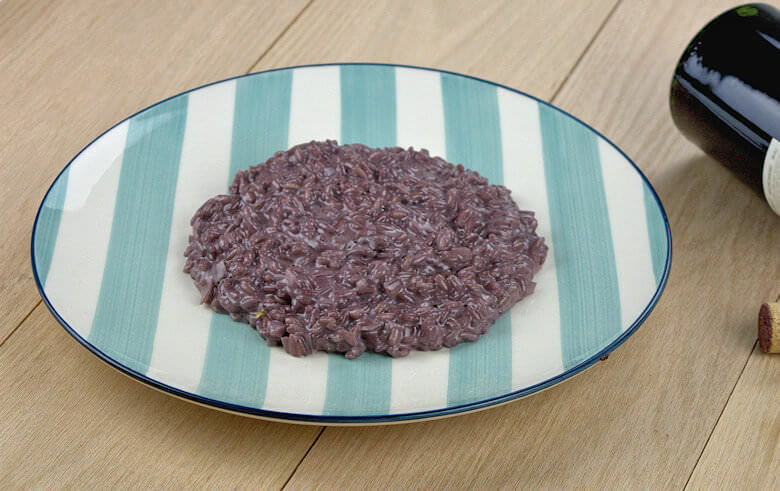 In the recipe below, you will see that there is nothing difficult in making this Red Wine Risotto with Mascarpone. The only thing you need is warm wine and stock and you add that ladle by ladle to the risotto. Add the wine first and allow that to be absorbed before you add the stock. Use vegetable stock and you’ll have a vegetarian dish. I have learned that risotto turns out better when you add the liquid warm, rather than cold. It may be my imagination, but it makes a softer risotto. When the wine and the stock is fully absorbed by the rice, add the Mascarpone, some Parmigiano Reggiano and salt and pepper to taste. It does not need anything else. It is full of flavor, creamy, looks different than normal. Enjoy! Simple red wine risotto with mascarpone. Wine with dinner and in your dinner. Most of the alcohol will evaporate during the cooking of the risotto, but not the flavor. Peel and chop the shallot. Warm the wine and stock. Heat the butter to a dutch oven and sweat the shallots in the butter. Add the rice, stir, coating the rice grains with the hot butter. Allow to cook for a little and wait until the rice grains are making noise and you see the rice becoming translucent. Add a ladle of red wine and allow it to be absorbed by the rice. Add a ladle of the vegetable allow this to be absorb. Repeat until all liquids are absorbed by the rice. Add mascarpone and stir until mixed with the rice. Finally add the grated Parmigiano Reggiano cheese, mix and it is ready to be served.